Merismopedia punctata Meyen, nom. illeg. Wyoming, USA: 1000x, DIC. 17 Sep 2013. Karl Bruun. © Karl Bruun. Merismopedia punctata Meyen 1839: 440, nom. illeg. Published in: Meyen, F.J.F. (1839). Neues system der pflanzen-physiologie. Dritter band. pp. i-x, 1-627, Plates X-XV. Berlin: Haude und Spenersche Buchandlung (S.J. Joseephy). This is the type species (holotype) of the genus Merismopedia. Adjective (Latin), dotted, marked with dots, spots, minute glands, etc. (Stearn 1973). Trevisan, V.B.A. (1845). Nomenclator algarum, ou collection des noms imposées aux plantes de la famille des algues. pp. 1-80. Padoue [Padua]: Imprimerie du Seminaire. Cao, X., Strojsová, A., Znachor, P. & Zapomelová, E. (2005). Detection of extracellular phosphatases in natural spring phytoplankton of a shallow eutrophic lake (Donghu, China). European Journal of Phycology 40: 251-258. Huber-Pestalozzi, G. (1938). Das Phytoplankton des Süßwassers. Systematik und Biologie. 1. Teil. Blaualgen. Bakterien. Pilze. In: Die Binnengewässer. Einzeldarstellungen aus der Limnologie und ihren Nachbargebieten Band 16, 1 . Teil. (Thienemann, A. Eds), pp. 1-342. Stuttgart: Schweizerbart. Husna, R., Zarina, A., Masud-ul-Hasan & Shameel, M. (2005). Taxonomic study of Cyanophyta from Lahore, Pakistan: I. Class Chroocophyceae Shameel. Int. J. Phycol. Phycochem. 1(2): 143-150. Park, J.-G. (2012). 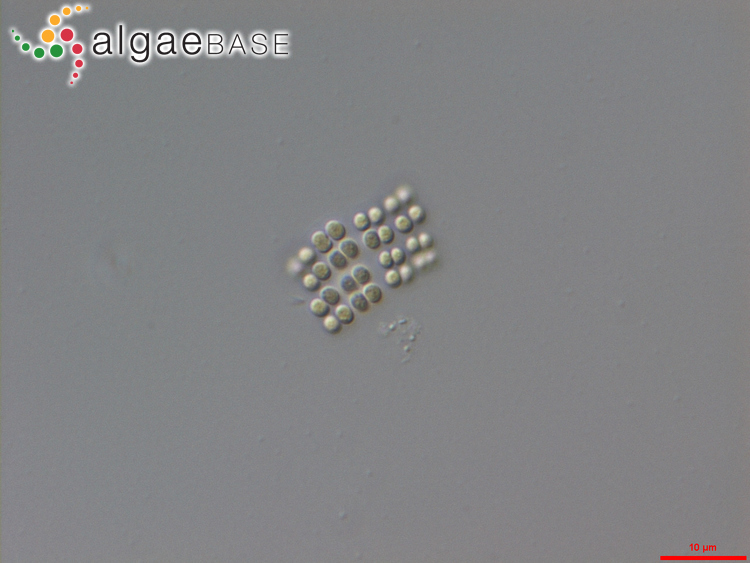 Algal flora of Korea. Volume 5, Number 1. 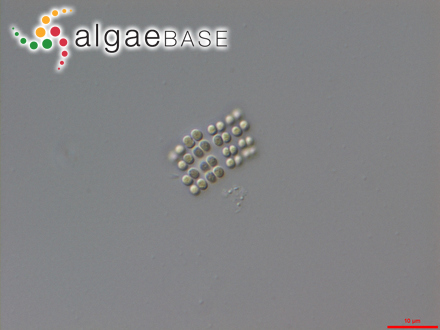 Cyanophyta: Cyanophyceae; Chlrococcales, Oscillatoriales Freshwater Cyanoprokaryota I. pp. [1-6], 1-71, figs 1-101. Incheon: National Institute of Biological Resources. Accesses: This record has been accessed by users 4378 times since it was created.